President Trump sparred with an unlikely source this weekend: a Navy SEAL. Not just any Navy SEAL, but William McRaven, the man who led the raid on Osama bin Laden. McRaven is not a fan of the president. Last year he said Trump's attacks on the media are the "greatest threat to democracy in his lifetime." In August he even dared the president to revoke his security clearance to stand in solidarity with former CIA Director John Brennan. He heard from McRaven again this week after Trump decided to revoke CNN anchor Jim Acosta's hard pass. Fox News anchor Chris Wallace asked Trump to respond to that criticism on "Fox News Sunday." Boy did he. "Wouldn’t it have been nice if we got Osama bin Laden a lot sooner than that, wouldn’t it have been nice?" Trump asked. "You know, living — think of this — living in Pakistan, beautifully in Pakistan in what I guess they considered a nice mansion, I don’t know, I’ve seen nicer. But living in Pakistan right next to the military academy, everybody in Pakistan knew he was there." "You’re not even going to give them credit for taking down bin Laden?" Wallace asked. "They took him down but — look, look, there’s news right there, he lived in Pakistan, we’re supporting Pakistan, we’re giving them $1.3 billion a year, which we don’t give them anymore, by the way, I ended it because they don’t do anything for us, they don’t do a damn thing for us," Trump responded. Trump also dismissed McRaven as a "Hillary Clinton fan" and an "Obama-backer." The retired admiral responded on Trump's favorite network, CNN. "I admire all presidents, regardless of their political party, who uphold the dignity of the office and who use that office to bring the nation together in challenging times," McRaven explained. Some of McRaven's supporters, like "Morning Joe" host Joe Scarborough, used the opportunity not only to condemn the president's behavior, but to accuse him of being anti-military and using troops on the border as "props." Trump is now lying about and attacking the Navy SEAL who led the attack on Osama bin Laden. Veterans like Eli Crane disagree. This is what they signed up for, he explained. Crane added that these men and women overseas "were not forced or obligated to spend holidays, birthdays and other special moments away from their loved ones." It was their choice. But back to McRaven. Trump is not likely to gain his respect anytime soon, particularly after last week's latest tussle with CNN reporter Jim Acosta. At a White House presser, Trump didn't like Acosta's pointed question about the migrant caravan and repeatedly told him to hand over the mic. Acosta refused and pushed away a White House aide's hand when she tried to grab it. That was enough for the White House to revoke Acosta's hard pass. Yet, a few days later a judge overturned Trump's decision and returned Acosta's credentials, and, people like McRaven would say, his First Amendment freedom. 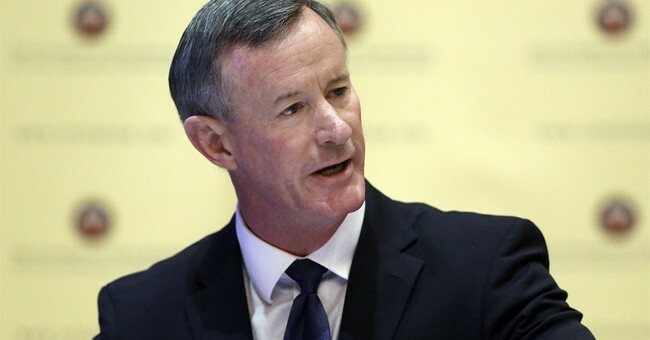 "When you undermine the people's right to a free press and freedom of speech and expression, then you threaten the Constitution and all for which it stands," McRaven said.